Mission San Antonio de Padua. Courtesy of Santa Barbara Mission Archive-Library. 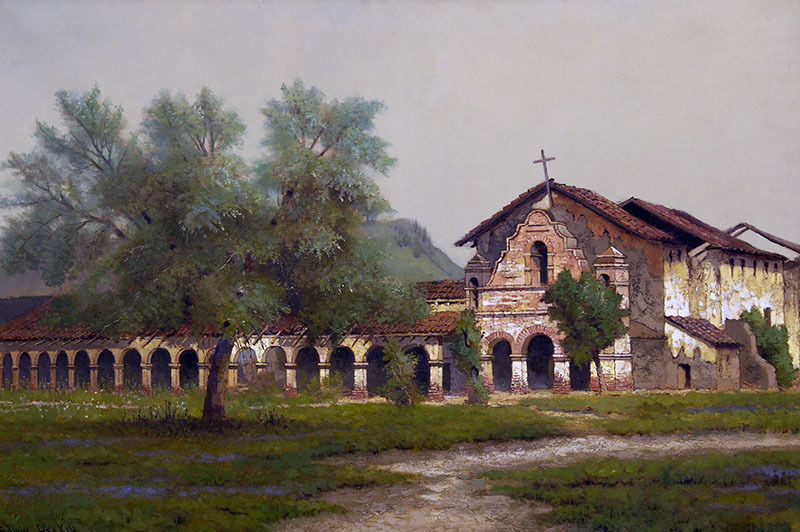 Mission San Antonio de Padua, nestled in central California’s Valley of the Oaks, is number three in the Franciscans chain of twenty one missions, established July 14, 1771. Located below the Santa Lucia Mountains, adjacent to the Hunter Liggett Military Reservation in Jolon, California, Mission San Antonio de Padua is almost as isolated today as it was more than 200 years ago. Like many of the missions, San Antonio de Padua fell into ruins after Secularization. Fortunately, restoration efforts led by the Historic Landmarks League and the Hearst Foundation have brought back the splendor of early California. In 1773, the fathers moved the mission from its original location to a spot further up Los Robles valley because of an unstable water source. Here, the mission fathers developed an extensive aqueduct system, which brought water from the nearby San Antonio River, to be used for bathing, washing, and crop irrigation. Today, the Mission boasts the most complete mission era water system in California. In addition to its sophisticated water system, Mission San Antonio was the first to use a Spanish, red-tile roof. Realizing the old thatched roofs posed a fire hazard, the fathers looked to the Spanish style, which used dried clay for tiles. Tiled roofs had two advantages over the old thatched roofs: they protected against fire, and they were also waterproof. Preserved at the mission are the colored notes used by the fathers to teach music to the native population. Traditional instruments included drums, violins, guitars, and harps, like this 19th-century model. The church at Mission San Antonio has been marvelously restored. Saint Anthony, the mission’s patron saint, stands at the center of the altar. The church boasts one of the first recorded California marriages, held in 1773. Peaceful and rustic, the mission now serves as a retreat center, where guests can find solitude, away from the busyness of everyday life. From US-101 : Exit at Fort Hunter Liggett/Jolon Road. Proceed 26 miles to Fort Hunter Liggett Reserve (the gate is not staffed). Turn left and proceed 5 miles to the mission. Usually 10a - 4p daily. Please call 831-385-4478 x17 for current hours.